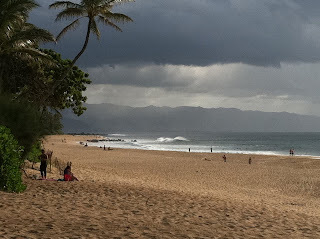 We took a little drive to the North Shore yesterday. 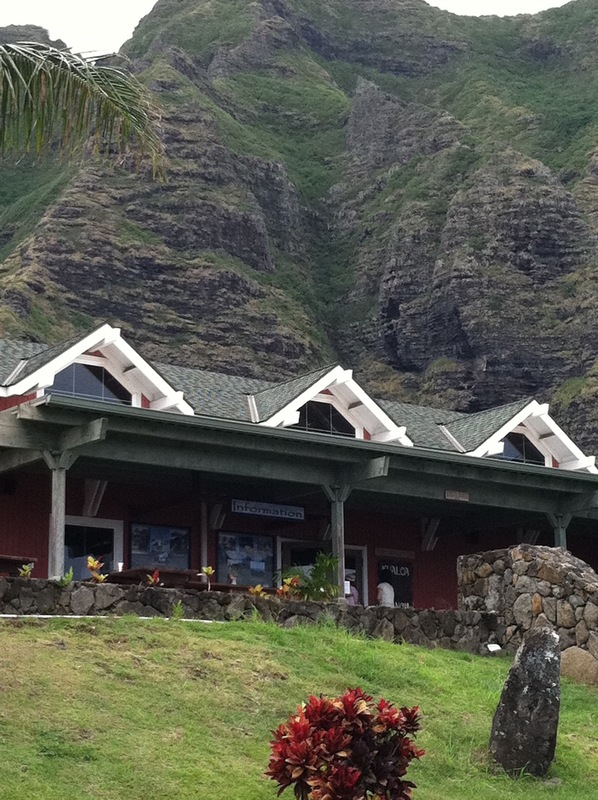 Our first stop was Kualoa Ranch, which used to be a sugar cane mill. There's also a tour which covers areas used in movies and TV shows. We'll save the tour for a time when friends or family are visiting. 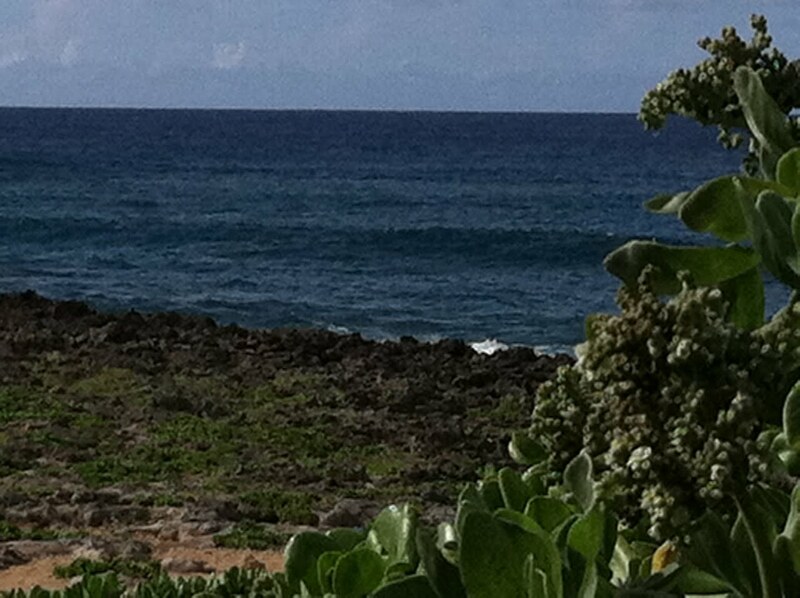 We continued up to the town of Laie, where the Mormon-run Polynesian Cultural Center and BYU-Hawaii campus are. Since it was Sunday, everything was closed, even the public beach! 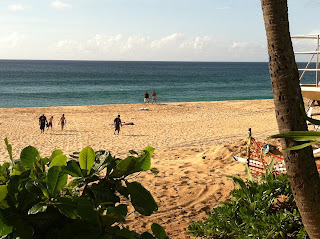 Off to Turtle Bay Resort in Kahuku, land of Kahuku corn. I'll tell you about the vegetables here another time. I had been to Turtle Bay briefly once before. 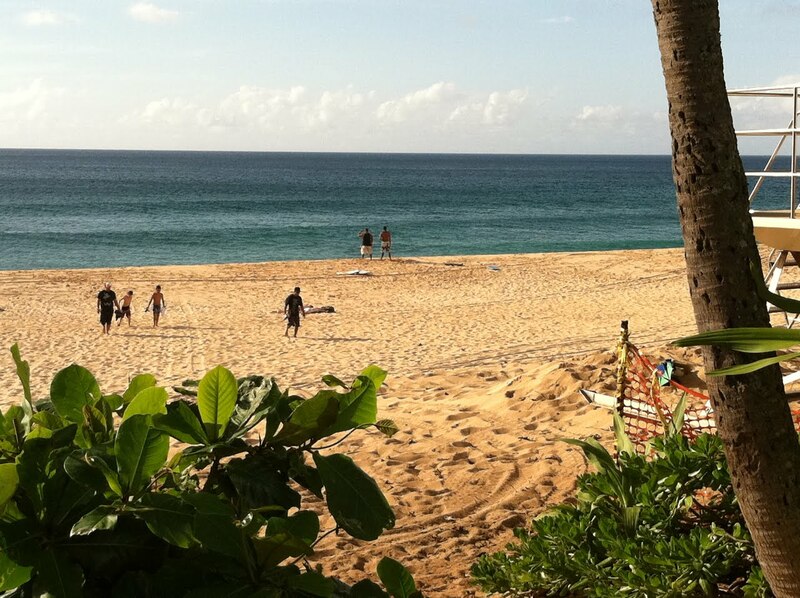 Turtle Bay was originally Del Webb's Kuilima resort. We ate lunch at their beachside restaurant where I discovered our waiter grew up in Laguna Beach. I went to high school in Newport Beach and back then the two towns were close. There was a stretch of Pacific Coast Highway that separated the two. At the edge of Newport Beach city limits and before entering Laguna Beach, there was only land with cars parked alongside the road where beach goers and surfers hiked down steep trails to secret coves and hidden beaches. Oh, and there was a shake shack that made awesome date shakes and on the other side, horses. Now, that area is called Newport Coast, filled with mansions and set behind gates and the once-hidden Crystal Cove is a state park with a large parking lot and a shuttle to take you to the beach. As teenagers, we used to park alongside PCH; wearing flip-flops and carrying our beach chairs and towels, we'd run across the then two lane highway and find our way to the beach. Our waiter went to Newport Elementary. I told him Newport Beach wasn't anything like it was back then. It's all about big houses and keeping up now. The California casual beach town is long gone. We said goodbye to the waiter and wandered around the resort. We found ourselves in a hallway leading to the Sunset Room. A worker was cleaning and asked if we wanted to come in and look around. I asked if they had a wedding there earlier. He said it was a retirement party. When I mentioned the flower petals strewn across the floor, he said, "She worked here over 30 years. We like to send them off with a little blessing." We left the aptly named Sunset Room and walked towards the ocean we could see from inside. 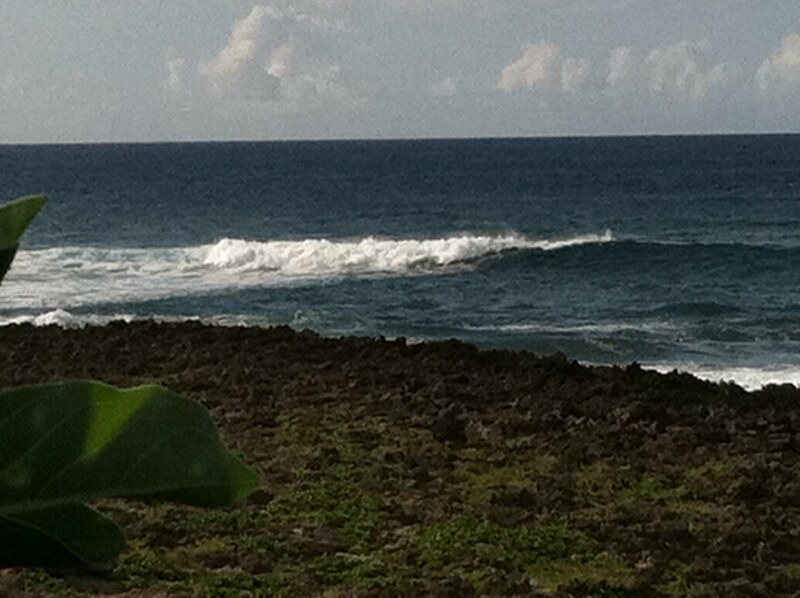 Surfers hugged the rocky point off the room and sat waiting for waves to ride into the bay on the left. 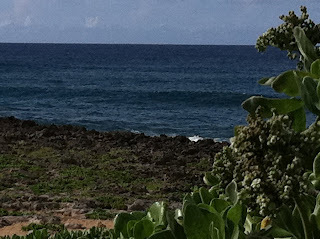 The point off Turtle Bay is the northernmost point on the island of Oahu. Nothing between that point and Alaska. I looked for Sarah Palin in her living room. Mark and I laugh at how the weatherman here calls the North Shore "the country". Yet I missed a call on my cell phone from the poor reception. I felt my phone vibrate in my bag a few times. Finally, when we walked back to our car the phone rang again. It was my mom. She continued, "That’s all they’re saying. They don’t know any more." I told her we were in the country and hadn't seen a TV in a few hours. 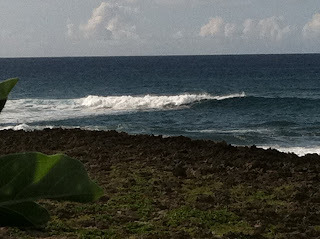 We continued driving around the north shore searching for radio reception of a news station. We picked up a Japanese language station and three baseball games. No word about Bin Laden and no cell phone reception either. We drove to the beach and saw a few military men just coming off the sand. I was tempted to ask them, but they didn’t seem to know the news. 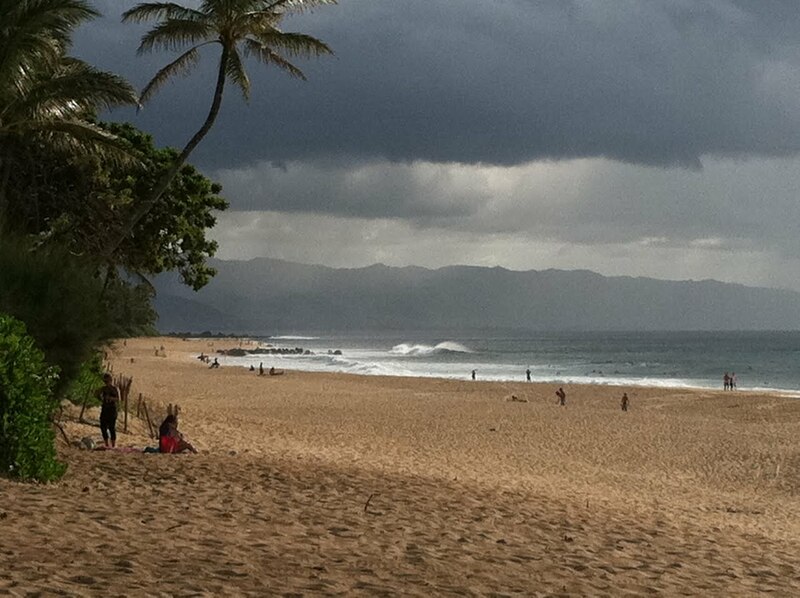 In the meantime, we stopped at the beach towns of the North Shore. One in particular reminded me of Newport Beach in the 70's. A mellow town with bicycles and neighbors all walking on the road alongside the beach. The residents are fighting the development of a high-end hotel there and I can see why. Once they let one in, the whole mindset and way of living in the town changes. Before they know it, there's a Newport Coast and a Real Housewives series in the once-small town. At the general market in Haleiwa, we heard people mention Bin Laden was dead, but we still didn't know the details. It wasn’t until we reached the Dole Plantation that my phone started to ring and buzz with voice messages finally coming through from friends calling. We drove past Schofield Barracks Army Base on the way home, unaware they were now on elevated status. Sometimes, I feel like I’m in another country here. No one seems to know the news of the U.S. or the world. Everyone goes on with their day, doing what they normally do without regard to the rest of the world. We drove home and turned on the TV news; glued to it for the rest of the night. My friends in New York and Washington D.C. seem so far away. Mark is loving the fact we can be so removed from the real world. “We’re never leaving,” he exclaimed earlier in the car. I’m really wondering how long I can live without the real world. I’ve been such a news junkie and always kept up with public affairs. I’ve lived in Los Angeles, Washington, D.C. and San Francisco. I’ve worked on Capitol Hill, in a barrio, attended literary events in San Francisco’s North Beach and belonged to groups that tried to change things for the better. Can I really drop all that to live on an island in the middle of the Pacific, away from a U.S. metropolis? Or do I remember how it was as a teenager, casually hanging out with friends in the harbor, on a boat, or at the beach and enjoy the simpler way?